Deep in the brown burnt hills of Southern California, there is a place called Topanga Canyon. The people wholive there are mostly musicians who grew weary of the many harassments of our culture. Dedicated musicians who searched for and found a place where they could create their music in pace. These Canyon Groups (as they have come to be known) are not neon hippies , but artists who have fled the music profession's hangers-on –al the phonies on the rock scene with their dubious talents and destructive ambitions. Here, in the serenity of Toppanga, the Canyon Groups hold festivals and concert! Where they learn from each other and grow. Here, in the home they've made for themselves, they meet to exchange ideas in an atmosphere of tolerance and creativity. Here they have found tranquility and freedom of expression in a setting of flowers, trees and grass. Of all the Canyon Groups, St. John Green is perhaps the most mystical both in the religious and philosophical sense. Each of their songs is intensely dramatic, intensely concerned with life and its mysteries. As arranger Mike Baxter explains: "In our environment we have experienced both good and evil. Our concept of evil is constructed in our music in hopes that those who listen and understand might learn to enjoy the beauty that really exists. We have learned from the people of the Canyon that there’s no substitute for being individually free. This is reflected in our songs and explains why each is different from the other. Perhaps the imagination, the fire and the Sheer artistry of St. John Green would have found its outlet in any setting. But those who know—those who have listened and understood and applauded these compelling, haunting songs like to think that the magic of the Canyon inspired the magic of St. John Green. A cover attracted my attention immediately, already fueling my curiosity with their flamboyant St. John Green...Now, this is something unique. this 60s psych album delivers one of the most interesting acts of the 60s, and quite possibly ever. St. John Green managed to impress with this unique attempt at psychedelic music. Very otherworldly and interesting, you should definitely give this record a chance. 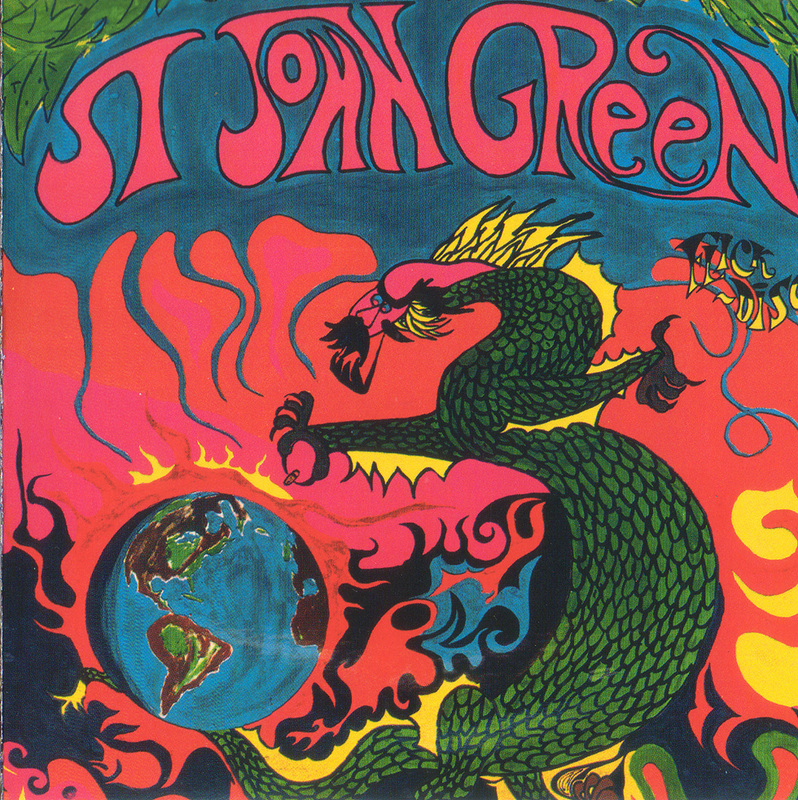 St. John Green was a ’60s psychedelic band from the area of Topanga Canyon (not quite LA, not quite Malibu, Neil Young lived there, Charles Manson befriended Dennis Wilson there…). Like most psychedelic groups, they only released one album and then faded into the night. Anyone who actively collects and listens to this type of music will tell be able to explain the wonder in these melodies and lyrics. The themeset of the music is much like the abstract expression of the cover art. 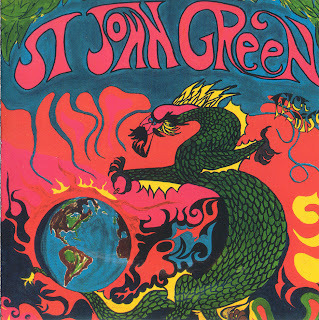 St John Green, as the back cover of this album explains, were part of the "Canyon scene," a loose association of musicians and hippies based in and around Topanga Canyon in California in the late 60s. Spirit, featuring Randy California and Ed Cassidy, were the best known Canyon group. 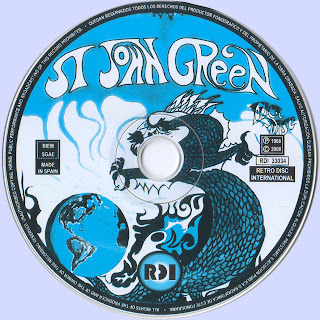 Although too patchy to be considered a "classic", this album by St John Green is a genuinely interesting period piece nevertheless, and it does include a handful of good songs. Produced by Kim Fowley, well, well ... The Dorian Gray of rock and roll is passed through it. OK, this guy has (among others, but his career is so large and convoluted that will not attempt to summarize today a tedious exercise) discovered the Stooges and helped to write the excellent Teenage Head of Flamin'Groovies, worked with Cat Stevens, the Byrds, the Seeds, the Beach Boys or Them, produced the first single from Soft Machine (Feelin 'Reelin' Squeelin ') ... Despite everything, we still a little reluctant to forgive the infamous Kiss with cronyism and other groups of grinning like a few years later, although it is conceivable, however, that his eccentric side has finally lead to the dark side of the force. Another one of those groups who released a single album before falling into oblivion, in total indifference, frequent pattern at this time. I must say that 1968 release date of the album, was a particularly fruitful for psychedelic music! Therefore, there is very little information about St. John Green, if not they had in Southern California, somewhere in Topanga Canyon, Mecca of the hippie culture in the 60's with Neil Young described so the pacifist spirit and rebellious in his After The Goldrush (and also, it seems, inspiration for Charles Manson but let this grim detail). But back to the point: St. John Green. Eager to know what this dragon flames on acid might well have spit in my ears until - hopefully - ablaze my eardrums, I hastened to put the cake on the plate to collect the first sparks psychedelics. The dragon-threatening narrator slowly stood 7th Generation Mutation, growing and rising to the way of a snake on an accusatory tone in a hypnotic atmosphere, oppressive and apocalyptic (There is no one, there is no love, there is no live ...). At that moment I knew that I had to switch my esgourdes a world diametrically opposed to the tendency baroque pop psyche that I inject almost daily in normal times: a creepy, creepy and dark but very both funny and satirical (Shivers Of Pleasure, Do You Believe). This paradox can be surprising, even disconcerting at first listen (Help Me Close The Door and unexpected drop is a perfect example). Throughout the album, Ed Bissot takes us on the road to death, punishment and damnation to hell (Messages From The Dead) in a whirlwind of experiments of all kinds. Pop one walk, almost at the limit of bubblegum elsewhere, we will make a snook, a real UFO album a parallel universe but whose title echoes him yet (St John Green). Titles suggested: the jazzy Woman Canyon while progressing intensity on a tribal rhythm and repetitive choruses until orgasmic exultation, Devil And The Sea and rejoicing harmonica solo, plus keyboards sunny Spirit Of Now. If you do not know what to do to counteract Halloween, try this potion. Atmosphere circumstances ensured with this album-like soundtrack (so much so that one wonders if there was not a film project behind it, or rather a cartoon dragon head n ' is reminiscent of the style of Yellow Submarine published the same year), a handful of jelly sweets in one hand and the outlet of your choice in the other. Do not forget to turn off the light and ultimate condition, switch to the second degree. You'll understand the name Fowley therefore sufficient by itself to arouse my interest even more, but without darker eyes closed. As always, my thanks to you Marios for sharing another wonderful psychedelic gem from your collection of records. This particular selection brings to mind the sound of the Doors circa American Prayer and Celebration Of The Lizard. In other words, it's totally great. The best of health and peace of mind to you. Link doesn't work... Could you fix it?